California Democratic Gov. Jerry Brown warned that America and the rest of the world are falling behind in the fight against climate change and likened the challenge to fighting the Nazis in World War II. In an interview for Sunday’s “Meet the Press,” the outgoing governor called on President Donald Trump to take the lead in addressing the issue. “Instead of worrying about tariffs, I’d like to see the president and the Congress invest tens of billions in renewable energy, in more-efficient batteries, to get us off fossil fuel as quickly as we can,” Brown said. President Trump has repeatedly downplayed the importance of addressing climate change during his presidency. Last year, he pulled America out of the international Paris Agreement meant to align the world’s nations toward reducing emissions and curbing the effects of climate change. And his administration has also rolled back a handful of Obama-era environmental regulations aimed at reducing the impact of climate change. Trump visited Brown and his home state earlier this year to survey wildfire damage. Brown admitted that while he appreciated Trump approving disaster funding for the state in the aftermath of the fires, he doesn’t think he made any progress convincing Trump about the dangers of climate change. “He is very convinced of his position. 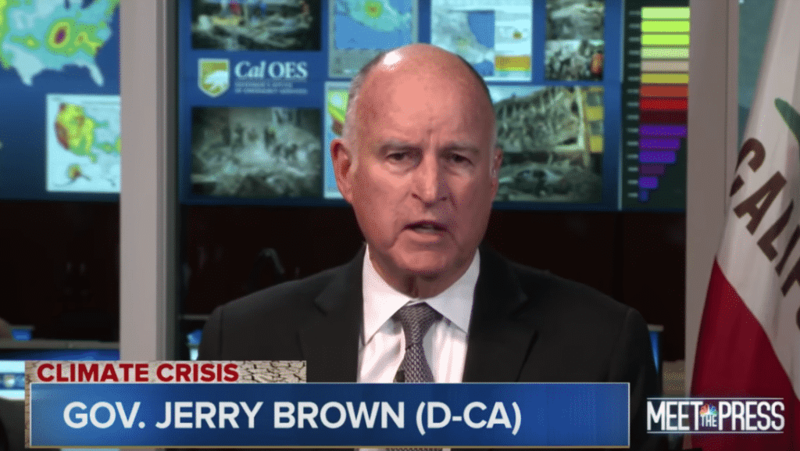 And his position is that there’s nothing abnormal about the fires in California or the rising sea level or all the other incidents of climate change,” Brown said. Former New York City Mayor Michael Bloomberg, the billionaire who has made climate change a key piece of his work outside of public office, also lamented Trump’s views on the issue. “It would be a lot more helpful, if we had a climate champion, rather than a climate denier, in the White House,” Bloomberg said. “You know, I’ve always thought, Trump has a right to his opinions. But he doesn’t have a right to his own facts. And the truth of the matter is this country and this world is in trouble.